The choice for August 1979 was quite difficult, with many suitable pictures already published on other pages. 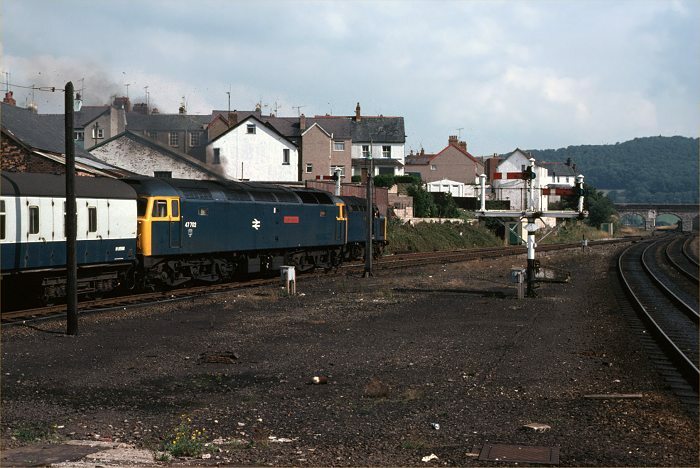 I've selected this view of 47702 Saint Cuthbert and 40024 at Llandudno Junction on 25th August 1979. 47702 was a very rare visitor to the North Wales coast line at this time. Recently converted for use on the Glasgow-Edinburgh shuttles, the introduction of these trains was delayed by late delivery of the driving trailer coaches for push-pull operation. The 47/7s were then free to roam the network for a few months. 47702 is seen on the 13:20 from Holyhead to Euston, leaving platform 1 at the Junction. Behind it, on the goods loop line 40024 awaits a path eastwards for its ECS train. The view from the east end of the platform has changed in the last 25 years. In particular the platform has been extended eastwards, covering the area up to the platform 2 starter signal. All the semaphore signals have been replaced, including the advanced starter in the distance, with its white painted square on the roadbridge to aid visibility.